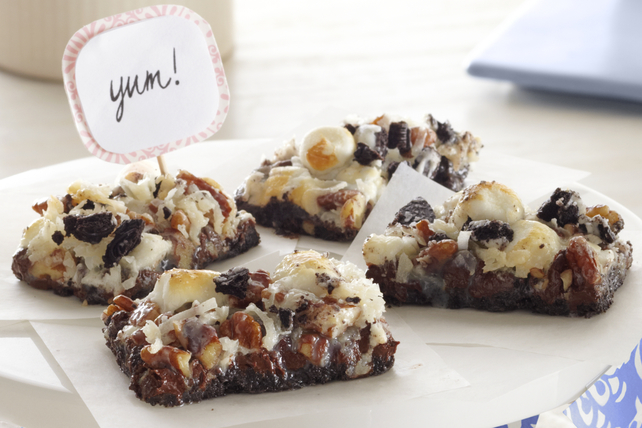 It wasn’t good enough to just make a simple rocky road bar recipe - we went one step further in the KRAFT KITCHENS and came up with a Double-Chocolate Rocky Road Bar recipe! OREO Cookies are the special ingredient in these hand-held dessert bars. Chop 4 cookies; set aside. Crush remaining cookies; mix with butter. Press onto bottom of 13x9-inch pan sprayed with cooking spray. Cover with layers of chips, marshmallows, nuts, coconut and chopped cookies. Pour milk over all ingredients. Bake 18 to 20 min. or until lightly browned. Cool completely before cutting into bars. Replace the chopped nuts with an additional cup of miniature marshmallows. Prepare crust using 2-1/3 cups Oreo Baking Crumbs instead of the crushed cookies.